Cross-platform media player VLC is often referred to as the “Swiss Army knife of media applications” for good reason: Not only does VLC play nearly any file you throw at it, but it can do so much more. From ripping DVDs to converting files to iPod-friendly formats, let’s take a look at the four coolest things you can do with VLC and start you on your way to becoming a VLC ninja. NOTE: Many of these VLC tricks use the same dialogs, so rather than repeat the same steps every time, I’ll be doing a thorough step-by-step once and then highlighting only the differences in the subsequent mini-guides. I’m using Windows in most of my examples, but since VLC is cross-platform, most of the same tricks should work just as well on any platform. VLC has a Streaming and Transcoding Wizard that’s supposed to make this process even easier, but it’s been buggy for me in all my tests, so I decided to go with the slightly more difficult method detailed below. 1. Open the Disc and Find the Correct Title: Insert your DVD and open it with File -> Open Disc. We need to find the right title to rip from the DVD, so at this point we’re going to preview titles from the disc one by one. To do this, start with 0 as your title number and increment one number at a time until you find the title you want to rip. I’ve found it’s quicker if you choose DVD rather than DVD (menus) at the top of the Open dialog so you only have to wade through actual video. 2. Pick a Folder to Save the Rip and Name It: Now that you’ve find the right track, you just need to tell VLC that you want to save it. To do so, tick the Stream/Save checkbox, then click Settings. Here you need to tell VLC where to save the file, so tick the File checkbox and pick a folder to save it to and then give it a name (e.g., My DVD Rip.mpg). 3. Determine Video and Audio Settings: Now you’re ready to tweak the final settings before it’s time to rip. 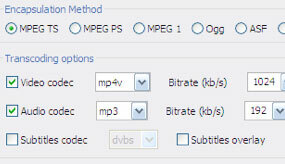 Tick the Video codec and Audio codec, then choose the output codecs you prefer. This is really up to you, and if you don’t have a preference I’ve had good results using the defaults described in this excellent VLC rip guide: mp1v for the video codec and mp3 for audio. If you need a specific file format for a mobile device, you may want to choose a difference encapsulation method and codec. Hit OK when you’re done. If you regularly convert files to a specific file format—say, for your iPod—you can set up a batch file with VLC that will make video conversions as easy as dragging and dropping the to-be-converted file onto the script. 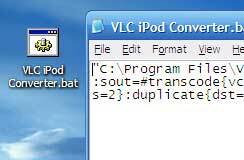 Create a new text file and save it as VLC Converter.bat. Make sure your filesystem is showing file extensions so you aren’t saving it as a text file (you don’t want to end up with something like VLC Converter.bat.txt). You need to make sure it’s saving with the BAT extension. That’s a lot of text, but it’s just telling VLC everything you would normally tell it in the Settings dialog. The %1 variable will be replaced by the name of the file you drop on the script. 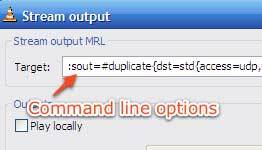 Copy and paste all of that text (and only that text) into your batch file and save it. That’s all there is to it. Next time you have a video file you want to convert for your iPod, just drag and drop it on your newly created batch script. 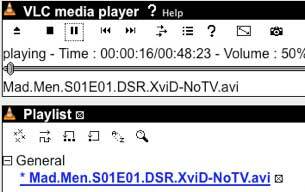 The script was built specifically for converting videos to an iPod-compatible format, but you can build your own scripts to do virtually common conversions you want. Now that you’re using VLC to rip your DVDs, you’ve got gigabyte after gigabyte of your videos on your desktop. Rather than copying all of those files to any other computer you’d like to play them on, VLC allows you to stream video over your network or even over the internet. First, go to File -> Open File. Browse to the file you’d like to stream, and then—like above—tick the Stream/Save checkbox and click Settings. This time, rather than outputting the stream as a file, we’re going to tick the UDP box and enter the local IP address of the computer you’d like to stream to. On Windows, you can find your computer’s local IP address by opening the command prompt (Win-R, type cmd, and hit Enter), and then type ipconfig and hit Enter. Once you’ve got that, enter it in the computer you’re streaming from in the text box next to the UDP checkbox you just enabled. Hit OK to accept your settings, then OK again to finish the setup. While you’re still on the streaming computer, go to Settings -> Add Interface -> Web Interface. Now it’s time to start the stream on your other computer, and doing so is a breeze. Just open VLC on your second computer, go to File -> Open Network Stream, and—assuming the UDP choice is selected and the port matches the port you used in the setup above (unless you changed it, they should both default to 1234), just hit OK to start the stream. You’re presented with a slight problem streaming the video using VLC this way, namely that you can’t control the playback from the remote VLC interface. Luckily you already enabled the web interface, so on the computer you’re streaming to, open a web browser and point it to the VLC web interface. If you’re streaming over a local network, find your streaming computer’s IP address the same way you did with the remote computer’s address above, then enter it into your browser with port 8080 appended to the end. Mine looks like http://192.168.1.2:8080. Through the web interface on the remote computer, you can control all of VLC’s playback. Handy, huh? You can stream video over the internet and not just over your local network, but you’ll need to either have a static external IP address or assign a domain name to your computer to do so easily. For more details on streaming with VLC, check out Engadget’s previous guide. If you prefer keeping ripped DVDs entirely in tact with you rip them to your computer, VLC may not be your tool of choice for ripping. Instead I’d recommend an alternate ripping tool like our one-click DVD ripping solution DVD Rip or one of the other DVD ripping methods we’ve covered in the past. Once you’ve ripped the full DVD to your hard, VLC comes in handy once again to play that ripped DVD, menus and all. We’ve highlighted how to play full ripped DVDs with VLC before, but for an even easier solution, check out DVD Play, a Lifehacker Code original that works as a more attractive front end to playing back full DVD rips with VLC.